Today I am going to talk about the feature comparison between two access switches which is Cisco 3850 and Cisco 9300. 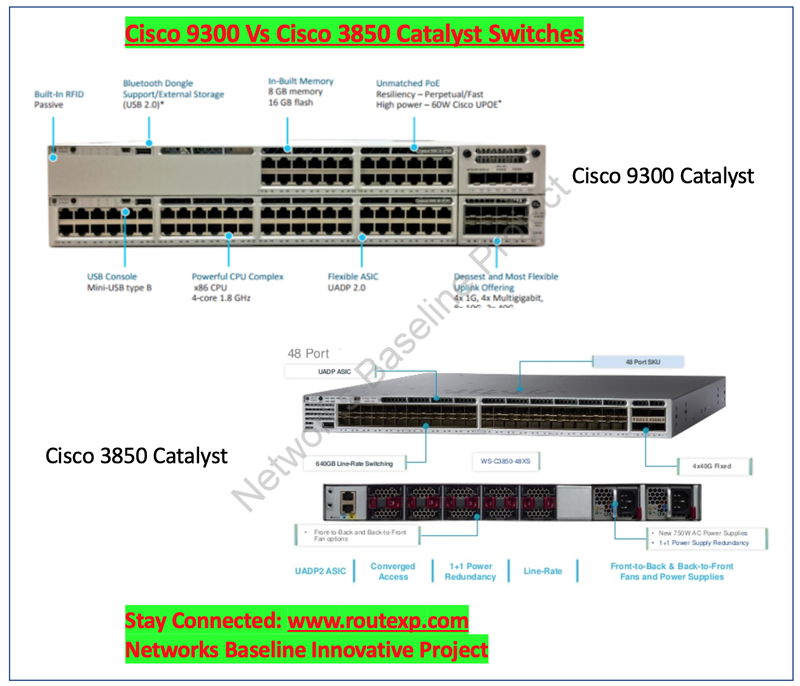 Cisco catalyst 3850 switch is an old switch with many features while Cisco catalyst 9300 is something which Cisco launches in 2017 and is awarded as one of the best switches in the enterprise networks. Earlier we talked about the comparison between Cisco 9300 and Cisco 2960-X switches but the real comparison of Cisco 9300 is with Cisco 3850 and Cisco 2960-X is with Cisco 9200 catalyst Switches. While talking about Cisco 3850 catalyst switch, These switches are come up with 24 and 48 port with SFP/SFP+ options with the maximum available power of 740W while if we are talking about Cisco 9300 switch we have similar kind of configuration of 24 and 48 Port with SFP/SFP+ and UPOE options. The maximum available power of 1100W which is much more than the Cisco 3850 catalyst option. The use of the X86 CPU used in Cisco 9300 while it is not available in Cisco 3850 Switch. KVM and container-based hosting environments by which you can have Application hosting in your network. You can have the internal flash capacity in Cisco 3850 is 2/4/8 GB while in Cisco 9300 it is 16 GB. The external storage capacity in Cisco 3850 catalyst switch is 16 GB while in Cisco 9300 it is 120 GB. The Cisco Catalyst 9300 Series provides the same robust high availability features as the Cisco Catalyst 3850 Series. In StackWise-480, eight switches can be stacked together to form a single logical switch, and both SSO and NSF mechanisms are maintained through failovers. For customers migrating from 3850 Series stacks to 9300 Series stacks, the same stacking cables can be used for stacking 9300 Series switches. The Cisco Catalyst 9300 Series is Cisco’s prominent fixed enterprise switching access platform. It is the next generation of the access platform, with many added abilities, and is well-matched for enterprises considering to migrate from their current Cisco Catalyst 3850 Series implementation.